Yan Fang Xin Bian (A New Compilation of Efficacious Prescriptions, 1846). 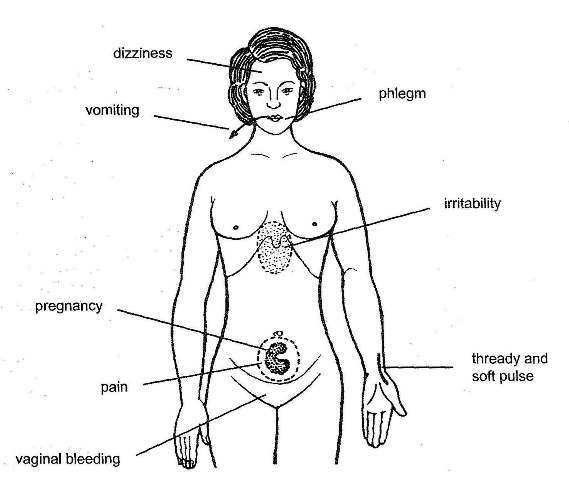 Traditional: Blood deficiency with damp-phlegm retention during pregnancy marked by lower abdominal pain and low back pain, vaginal bleeding, vomiting, excess phlegm, irritability, heavy-headedness, dizziness, a flabby tongue with greasy coating, and a thready and soft pulse. It is also used to aid with a smooth delivery or a delivery of a dead fetus. Modern: Difficult labor, abdominal and low back pain during pregnancy due to unstable gestation.